"Poor water quality, increased sediments and nutrients - conditions increasingly being faced by the modern day reef - caused a delay in the Reef's growth of between seven hundred and two thousand years duration," said Belinda Dechnik, lead author of an article published in Marine Geology in May. "It took hundreds more years then we would have expected to establish itself and even longer to attain the complex level of biodiversity that much of the Reef has become famous for." "While that may appear inconsequential in the 700,000 year history of the Reef even a decade of such delayed growth would have a rapid impact on today's Reef and the experiences of the estimated two million people who visit it every year," Dechnik said. The research was led by the University of Sydney's School of Geosciences. It was conducted at the University's research station at One Tree Island on the Reef. The researchers sampled 15 reef cores from the Southern Great Barrier Reef. The cores were radiocarbon dated to establish their ages. Species of reef corals were also identified to establish any coral community changes over the past eight thousand years. The findings show that when the Great Barrier Reef started its current regrowth, following the sea level rise when the ice sheets last melted eight thousand years ago, it was acutely sensitive to the turbulent conditions. The increase in sediments and nutrients following the flooding of the pre-existing reefs is likely to have been responsible for the poor water quality. "Not only was there a lag in reef growth of up to two thousand years following the flooding of the previous reef platforms but the reef communities that grew there were much less complex than those inhabiting those areas of the reef today. It took another two to three thousand years for the rich diversity that we see in those reef areas today to become established." 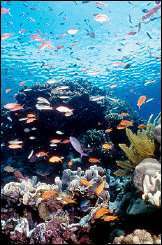 The researchers believe the findings have important implications for the future health of the Great Barrier Reef, as port expansions and high nutrient runoff is expected to increase over the coming decades, particularly in Gladstone, adjacent to where the reefs that were studied are located.